﻿ Merus Ring in Water Work - no lime slurry deposits in the pipes. Water suppliers has to treat the drinking water, before it is brought to the customer. Depending on the raw water, one process step is to stabilize the pH-value. Drinking water should have a chemical balance and be neither too sour nor too alkaline. It is recommended by the authorities to have a pH value of in between 7.0 and 8.5. For this purpose lime slurry is used. Lime slurry is a suspension of calcium hydroxide in water. People call lime slurry also „liquid“ lime or whitewash. This slurry or hydrated lime is chemically very active. It can be pumped and makes is rather easy to handle. The disadvantage of limestone slurry, it is very abrasive and viscose. Often hoses are used rather than iron pipes as they are easier to exchange when blocked. Limeslurry causes several technical problems for the water suppliers. Not only hoses, but pipes and water tanks are heavily affected by calcium carbonate. Especially the pumps supplying the water tanks with the lime slurry are often blocked by limescale. This leads to frequent downtimes. There needs to be a service team available 24/7. 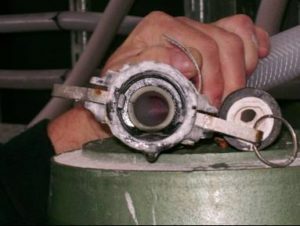 The first picture shows the inside of one of these hoses after a few days of operation. It was taken right before the Merus Ring was installed. The hose is 180 m long and both ends look the same. Therefore we assume, the deposits settled over the entire length. We installed one Merus Ring right behind the shut-off valve at the beginning of the hose. After the installation of the Merus Ring no limescale could settle in the hose anymore. As you can see in the second picture the hose treated with the Merus Ring is clean. 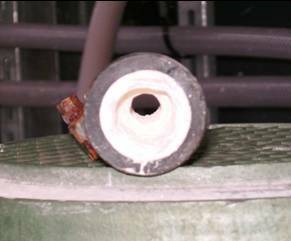 Limescale is visible only on the outside of the connecting piece. The pumps which required before frequent maintenance weren’t blocked anymore and far less maintenance and emergency repairs were necessary. As a positive side effect it was found the lifetime of the pumps was increased a lot. Thus the investment for the Merus Ring payed off after some months. Since this first test we installed some hundreds of Merus Rings where lime slurry is used. Not only water suppliers are using lime slurry. Waste water is generated in many industrial processes. To neutralize this calcium hydroxide is used before giving in the central system. Odor control or metal precipitation is another possible application. We installed over the years some hundreds of Merus Rings, where lime slurry is used.